What Is The Phenomenon Of Global Dimming? The gradual reduction in the amount of global direct irradiance at the surface of our planet due to factors such like pollution is called global dimming. Particulate atmospheric pollution from industries, cars, and planes cases global dimming. Global dimming is the steady decline in the direct sunlight reaching the ground. The increase in particulates like sulfate aerosols in the atmosphere cause global dimming. Global dimming interferes with the hydrological cycle by merely reducing the evaporation process, and is believed to cause rainfall reduction in some places. The decline in global irradiance also creates the cooling effect which counteracts the effects of the greenhouse gases on global warming. Scientists believe that the amount of energy reaching the Earth dropped by about 22%, and since 1950 direct irradiance decreased by 10% in the United States, 9% in Antarctica, and by about 16% in Europe. The presence of the aerosol particles in the atmosphere due to human intervention is the primary cause of global dimming. The fossil fuels used by the industries and the combustion of engines produce soot, ash and sulfur dioxide which together lead to particulate atmospheric pollution. The vapor emitted by planes referred to as contrails also causes heat reflection and global dimming. The aerosols and the other particulates absorb the solar energy in the atmosphere and then reflect it back to space. These pollutants can also act as nuclei for the cloud droplets, and the droplets of water in the atmosphere coalesce around these particulates. 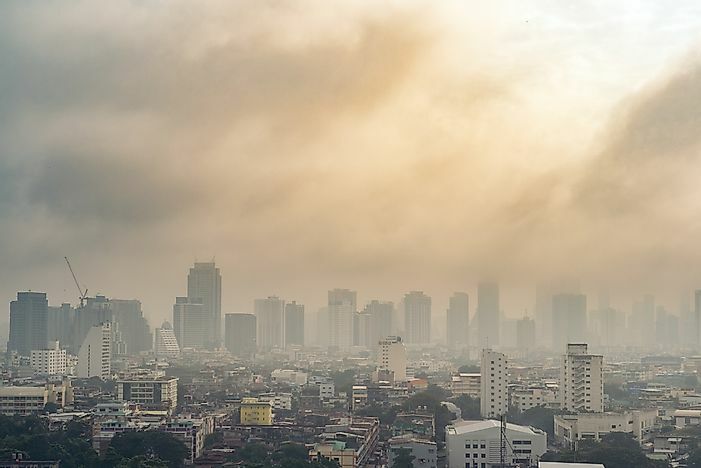 An increase in pollution results in more particulates fused with water droplets in the atmosphere which create a polluted cloud. The contaminated clouds also referred to as brown clouds have bigger and denser droplets. These droplets make the cloud more reflective. Other than blocking the heat produced by the Earth's surface from reaching the atmosphere, the brown cloud also reflects more sunlight into the atmosphere. Global dimming has severe effects on the environment and all the living beings. Atmospheric pollution caused by aerosol particulates weakens the water cycle on Earth by reducing rainfall and lowering the fresh water supply. According to the study conducted by Scripps Institution of Oceanography, small soot particles, among other pollutants, have a significant effect on the hydrological cycles. The hydrological cycle derives energy from sunlight. Therefore, during the hydrological cycle sunlight heats up the ocean, resulting in water escaping into the atmosphere in the form of moisture, which later falls as rain. Tropospheric aerosol reflects sunlight back into space thus spinning down the hydrological cycle. Many scientists believe that global dimming masks the effects of global warming and that reducing direct irradiation can result in future temperature increase. While global warming increases the atmospheric temperature, global dimming helps lower the atmospheric temperature. Although these two phenomena have complementary effects, the two occurrences helped reduce the rate at which the temperature increased over the years. The brown clouds have masked over 50% of global warming through global dimming, and reducing the latter will enhance the effects of the other phenomenon. Therefore these two theories must be stopped at the same time, since decreasing the effect of one can create a severe condition which can prove fatal for everyone on Earth.